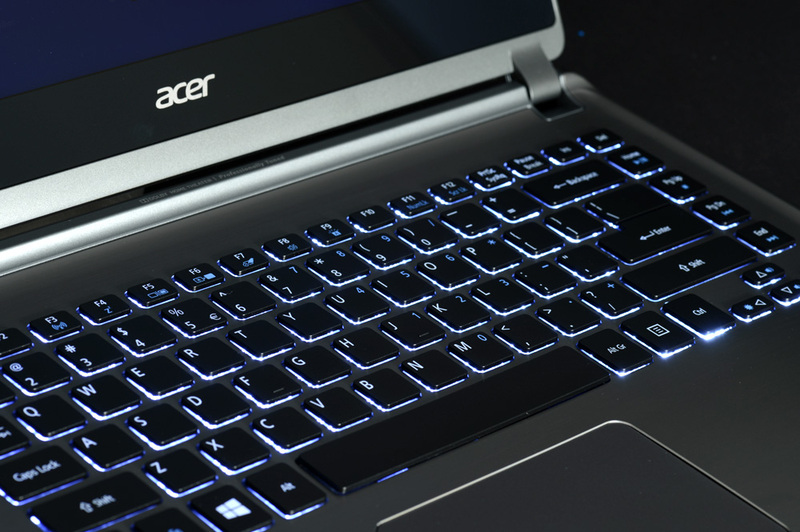 We still highly recommend the Acer Aspire M5 to anyone looking for an Ultrabook. Just skip the touchscreen. It’s not worth the premium. Earlier this year we took a look at the Acer Aspire Timeline Ultra M5, the company’s latest attempt at a mid-range Ultrabook. It was excellent. We thought it provided a strong value thanks to its use of Nvidia discrete graphics at a price below $800. 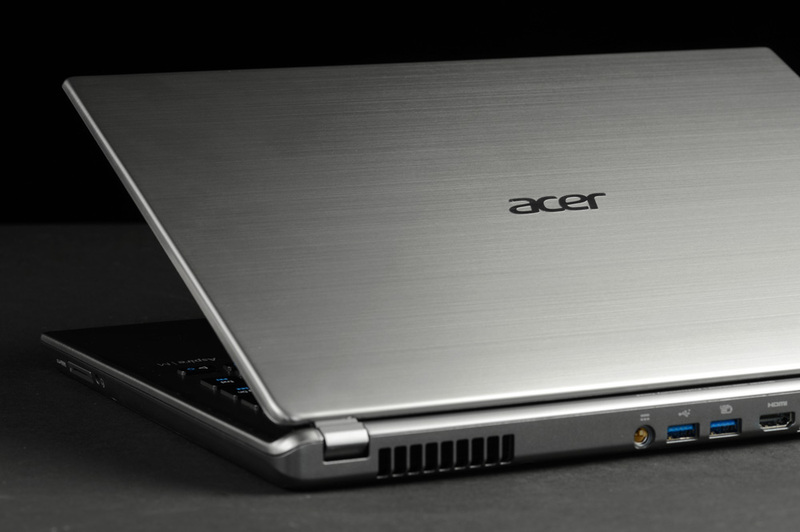 Now, Acer has updated the laptop with a touchscreen for Windows 8. It’s in many ways the same as it was before, but the touch model relies on integrated graphics and is priced at $799, slightly more than the standard 14-inch Acer Aspire M5 with discrete graphics, which starts at $780. Is reduced gaming performance worth sacrificing for the touchscreen experience? Let’s take a closer look. Acer’s Aspire M5 is, from the perspective of design, one of the most basic models on the market. It doesn’t come in various colors, it doesn’t use unusual materials, and it doesn’t have a heavily tapered or rounded edge. It’s just a downsized laptop. That’s fine, however, because it’s a well-built device covered in handsome gunmetal gray aluminum. Extensive use of metal is no longer unique but few laptops sold at this price use a lot of it. Build quality is also a strong point despite a few large panel gaps and the inclusion of an optical drive (which usually weakens a laptop chassis). Picking up the M5 is like picking up a single slab of material. 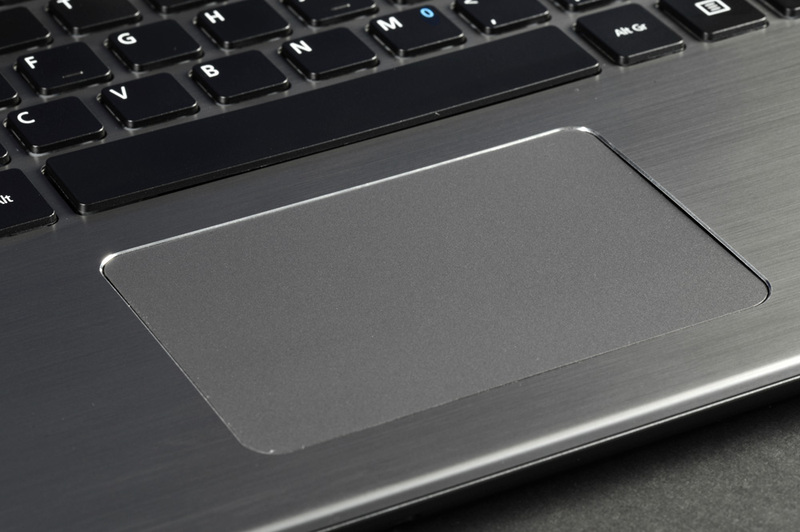 The only design misstep is the power button, which resides at the front edge of the laptop. It’s easy to accidentally trigger during lap use, leaving the user wondering why the laptop has randomly entered sleep mode. 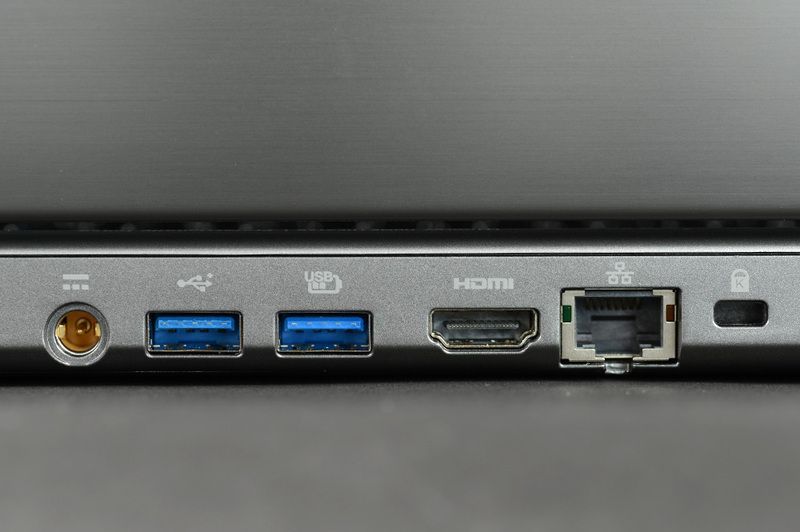 Ports are only found on the rear of this laptop and include two USB 3.0, one HDMI, and one Ethernet – and that’s it. This is an average array of connectivity for the class. As usual, we’d prefer to see at least three USB ports. The M5 Touch, like its predecessor, is not particularly small for a 14-inch laptop. It’s reasonably wide and quite deep, which provides plenty of room for the keyboard and a spacious palm rest. Acer’s made use of the acreage by installing a spacious set of keys that are well laid out and intuitive. Key travel is shorter than we’d like to see and reduces the typing experience a bit. Still, it’s at least average for an Ultrabook. Backlighting is standard and controlled via a keyboard shortcut. There’s no brightness control – just on or off. Fortunately, the default brightness didn’t blow out our retinas. Acer’s blocky key caps do a good job of keeping light beneath the keys. 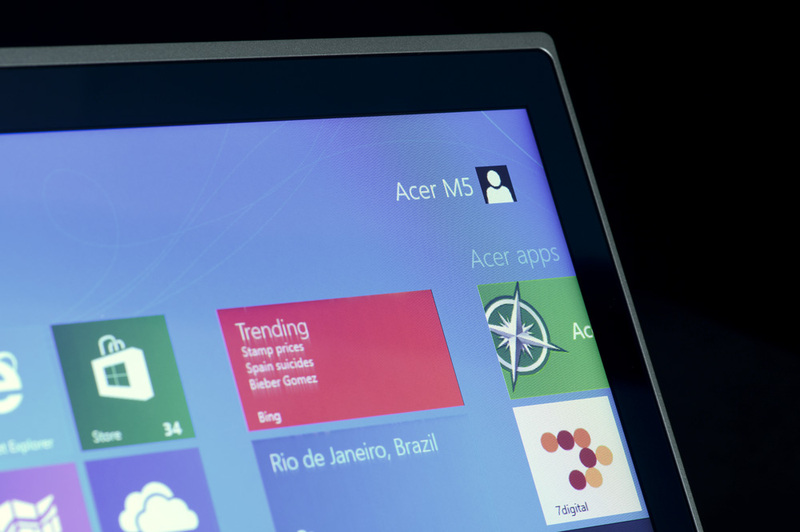 Users can navigate Windows either with the spacious touchpad or the touchscreen. Please note – this laptop is not a convertible. It’s merely a touch-enabled laptop, which means the user has to lean forward from a normal typing position to touch the display. Sound uncomfortable? It usually is. Still, we found that having the touchscreen was sometimes useful. Using the laptop as a portable music and movie player is much easier. It’s possible to play or pause music by tilting the screen and tapping instead of leaning down and using the touchpad. But that doesn’t mean the M5 is a great multimedia laptop, however. Its display is where the M5 loses its multimedia appeal. In our testing, we found it produced only 60 percent of the sRGB spectrum. Viewing angles proved poor, black levels were average, and maximum brightness is unimpressive. To be fair, none of these results are that unusual for an inexpensive Ultrabook. Consumers will have to pay at least $1,000 to snag a competitor with an IPS or high-resolution display, but that still doesn’t mean we’re pleased with what we’ve seen. Audio quality is a different story. 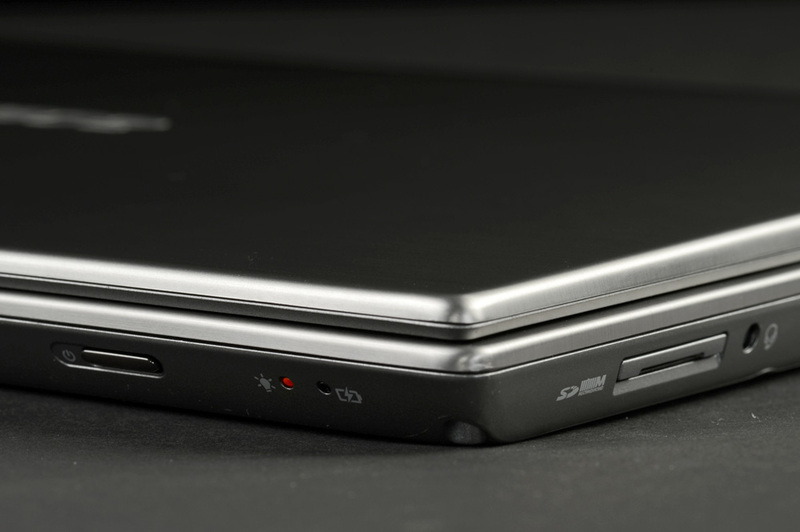 The touch version, like the standard M5, offers excellent audio for a thin laptop. There’s some reproduction of bass and the speakers can nearly reach their extremely high maximum volume before any distortion becomes evident. A decent pair of headphones or external speakers will still be an upgrade, but the M5 can hold its own if neither is available. In our review of the M5 with discrete graphics we noted that a small part of its exterior reached a blazing 113 degrees Fahrenheit at load. We reckoned the Nvidia GPU could be blamed and that integrated graphics would let the laptop run much cooler. That didn’t turn out to be the case. Load testing of this new version, which uses only Intel integrated graphics, resulted in a maximum temperature of 107.1 degrees Fahrenheit on the bottom of the laptop. Only a small spot reached this temperature, though that’s little consolation. Most of the laptop’s bottom was in the high 90s or low 100s, which can be blamed on the lazy system fan. We noted during sound testing that the system registered a maximum of 45.9 decibels at full load – which is lower than average. It seemed as if the system fan did not have a true “high” setting. It was no more aggressive during 3D gaming than it was while we browsed the Web. The new Acer Aspire M5 touch weighs in at about 4.5 pounds. 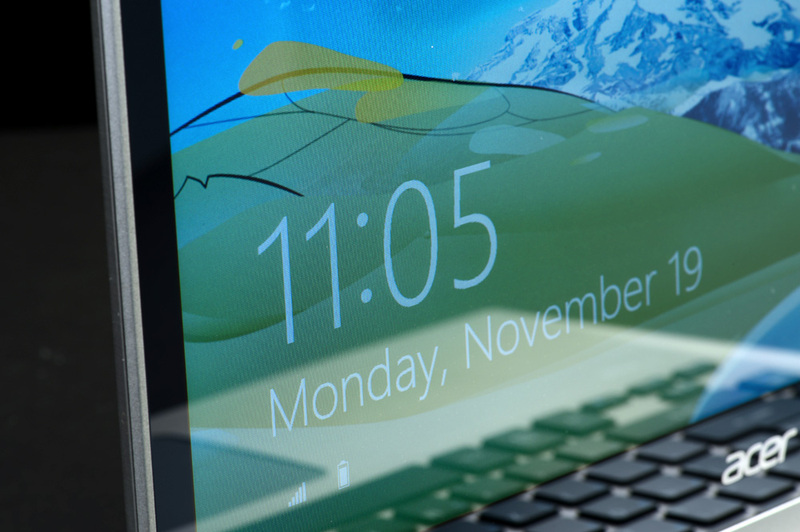 That’s heavy for an Ultrabook – but most competitors have a smaller display. The heft is about right for a 14-inch laptop. 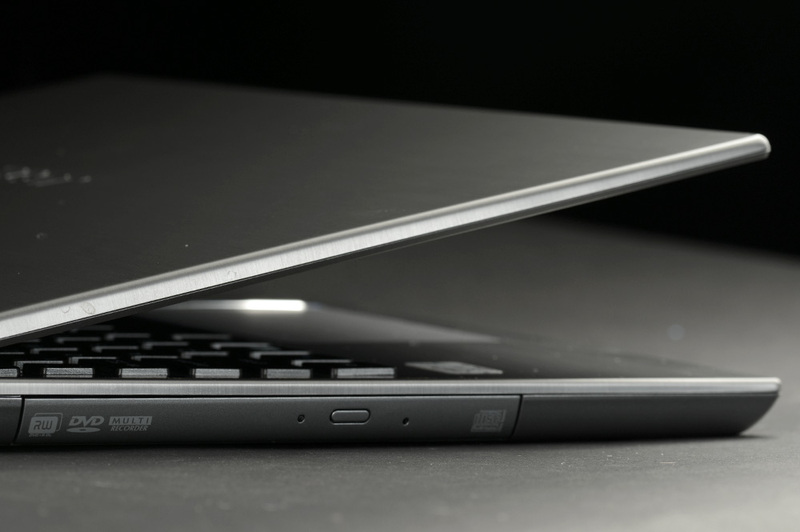 Its thickness of 0.81 inches teases the upper limits of what can be considered an Ultrabook. Any extra baggage is redeemed by our battery life results. The Battery Eater load test conquered the M5 in 2 hours and 23 minutes, and our light-load Reader’s test extended endurance to 6 hours and 50 minutes. We also managed about 5 hours in our Web browsing test. All of these results are above average. Power testing revealed that the M5 used as little as 14 watts at idle and as much as 29 watts at load. These are reasonable figures, but not the lowest in the category. Bloatware on this new model is basically identical to that found on the Windows 7 version we previously reviewed – which means there’s a lot of it. 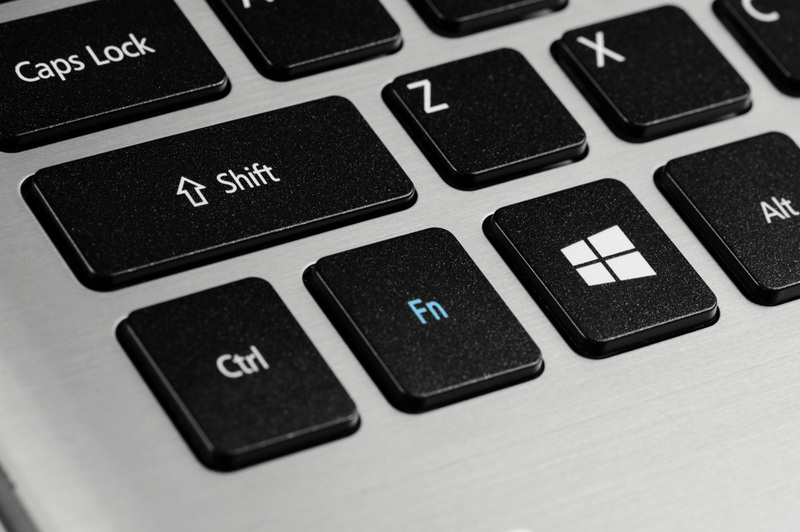 Multiple shortcuts litter the desktop, and Norton anti-virus is a constant annoyance. These problems migrate to the Windows 8 Start screen. A huge block of interface tiles are exclusively dedicated to various forms of bloatware. It’s a double-whammy since users see the apps when entering the Start screen and then see the same when using the desktop. Acer needs to get this under control. Our review unit arrived with the same Core i5-3317U processor as the Acer Aspire M5 we previously reviewed. Indeed, the Touch model seems identical in every area besides graphics. We were not surprised to see it put out a SiSoft Sandra Processor Arithmetic result of 35 GOPS and a 7-Zip result of 7054 MIPS. Both scores are almost identical to the previous M5 and absolutely average for the category. PCMark reached a score of 2,791, which is an average score for the category. 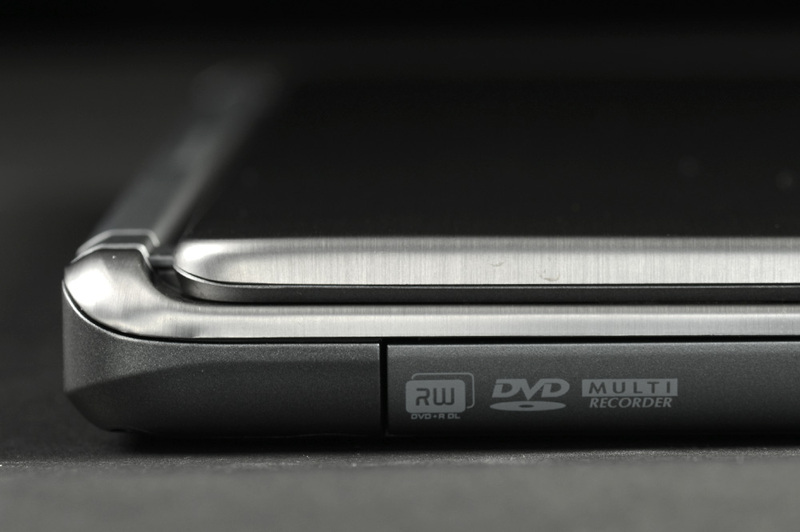 The M5, like most inexpensive Ultrabooks, uses a small solid-state cache drive alongside a large mechanical drive. It’s a combo that offers the responsiveness of a large solid-state drive at a lower cost, though it can’t match the raw data transfer speeds of a dedicated SSD. 3DMark 06 and 3DMark 11 turned in respective scores of 4,956 and 591. These scores are two to three times lower than those provided by the earlier model’s Nvidia discrete graphics. The M5 Touch, like most laptops with Intel integrated graphics, can only play modern 3D games at low detail settings. While overall performance is average, we’re frustrated that Acer didn’t provided discrete graphics with the $799 touch model. It was the ace up the previous model’s sleeve, and the M5 is dull without it. Acer’s Aspire M5 Touch is a strong Ultrabook. It offers good battery life, an enjoyable user interface, and high build quality for a low price. Adding touch doesn’t add much to the experience but, well, it adds touch. This can be useful in certain situations and if the touchscreen works well when called upon. There’s just one small problem. The touchscreen isn’t free. Acer’s Aspire M5 with integrated graphics and no touchscreen is usually sold for $649 to $679. This means the touch model charges $120 to $150 for a feature that most consumers will use perhaps a few times per day. Raising the price causes a host of other concerns as well. Our praise of the original M5 was heavily dependent on value. Its poor display and bulky chassis were excused by its optional discrete graphics and low price tag. The Touch version throws out these traits and therefore ruins the laptop.